Not knowing what to expect exactly (of course I knew the characters but I’d never actually seen a Muppet movie or show), I was pleasantly surprised by this whimsical comedy. Everything here is a source of happiness: the adorable performances from the hugely likeable Jason Segel and the ever bubbly Amy Adams, the myriad of celebrity cameos and supporting players, the catchy songs (except for the dreadful, and Oscar-winning, “Man or Muppet”), the visual gags, the self-aware and often cynical (but still innocent and clean-cut) humor. This is the perfect way for someone to become a fan of these lovable felt puppets. You’ve never seen any Muppets movie or TV show before this?? 😦 I cant recall the titles of the ones I watched, because I watched them so long ago and there are so many, but I love these creatures. 🙂 I’ll try to see this one. Ah, your new tradition of selecting fan-produced art to illustrate your movie reviews continues. 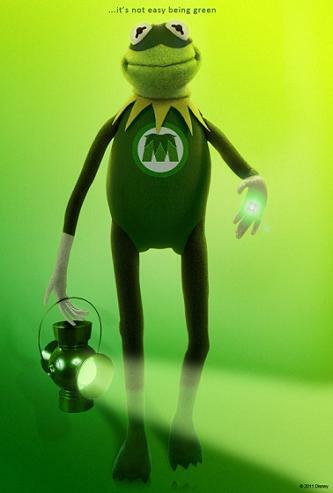 Kermit as Green Lantern is so inspired. On the movie, I actually think 4 stars isn’t enough, but great review as always. You know, you should think about creating an index page for your reviews (list the titles A-Z and add the links to the titles). It doesn’t take much time, and it’s actually quite useful. Just a suggestion, but I find indexes VERY convenient. Thanks for the suggestion. But I don’t really know how I would do that. Any tips? You create a new page, and while the editor is open, you open a new tab or window and go to your WP dashboard. Then you put in the title of your most recent review, put the one before that above or below it (wherever it goes ABC-wise), etc. Then you go to your reviews (the wordpress address slash each review title) and add the links to the text. It sounds complex but its actually quite simple. But i would recommend separating into two different days: one for the text and one for the links. Otherwise youll get bored and give up. Yet another brilliant poster! Adorable is the perfect word to describe The Muppets, it’s so innocent and enjoyable. I can’t quite understand why some people don’t like it. I also love the soundtrack to this, I have to fight to keep many of the songs from popping into my head! I just got this out of the library, and now I’m dying to watch it more than ever before. Also got Anonymous, Letters from Iwo Jima, Anchorman (the so-called “Unrated, Uncut & Uncalled For!” edition), Driving Miss Daisy, and Good Will Hunting.